Kerala spicy mixture is a deep fried snack that you can make in large batches and store for over a month.Mom used to make this in large batches and store for a quick evening snack.I loved this snack very much but with time had become quite bored of this mixture and so had never thought to make this at home.However,away from home reminds everyone of their mom's preparations and nostalgia sets in.One fine day,I badly craved to have this crunchy snack with tea.Though I initially settled with the store brought mixture,but they never gave me this taste.So,ended up making this spicy mixture at home.Mixture making is not a tedious job but all the ingredients listed is a must,for a good mixture.I had posted the low fat version of corn flakes mixture sometime back and this is quite similar to that.Try and enjoy this at home !! In a bowl,add the chick pea flour,rice flour,chilly powder,turmeric powder,asafoetida and salt.Using water make a smooth dough like we do for idiyappam(string hoppers).Using the idiyappam mold,Pinch out small balls of dough and press down in the mold.Close and keep ready. Heat oil in a pan upto 2" deep and wait till oil is hot.Press down the mold holding upright in oil and make circular swirls to fill the rounds(don't over crowd).Wait sev to lightly turn crisp on one side and then turn the other side.Cook both sides and drain using slotted spoon on a paper towel. Repeat the same step of preparing sev till you finish all the dough.Drain on paper towels and leave to cool.Switch off flame till you prepare the bhoondi batter. Make a thin batter using chick peas flour,chilly powder,asafoetida,salt and water listed under bhoondi. Heat the same oil,using a slotted spoon with round sharp holes,pour the batter through the holes.You may find small roundels(bhoondi )in oil and don't overcrowd the oil with bhoondis. Wait till it turns slightly browned.Drain on paper towel.Keep aside. In the same way,fry the groundnuts,beaten rice(aval),dalia ,curry leaves separately.Drain on paper towels.Keep aside till you assemble. Crush the sev to your desired length size and add in all the fried bhoondis,ground nuts,dalia,beaten rice,curry leaves.Add in the chilly powder,asafoetida and salt.Quickly toss it well to coat everything evenly.Check for salt and spice,adjust as per tolerance. Cool completely before storing in containers. 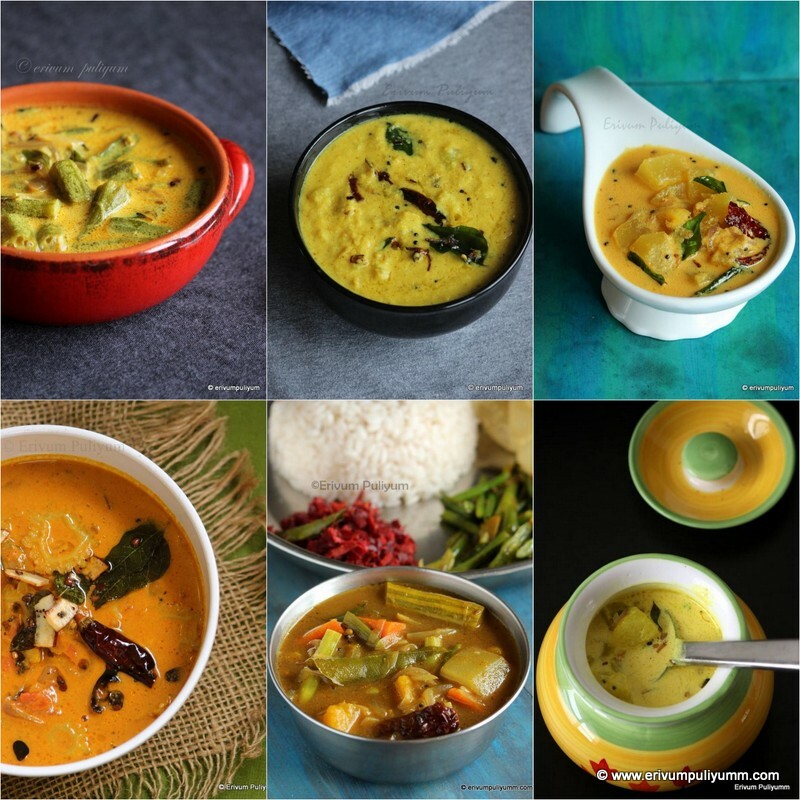 * Use a slotted spoon that has sharp edges under the spoon,the bhoondi comes perfect with those slotted spoon. * You can use thin mold for making thinner sev.I had this as the smallest size. * Rice flour adds crispiness to the sev. 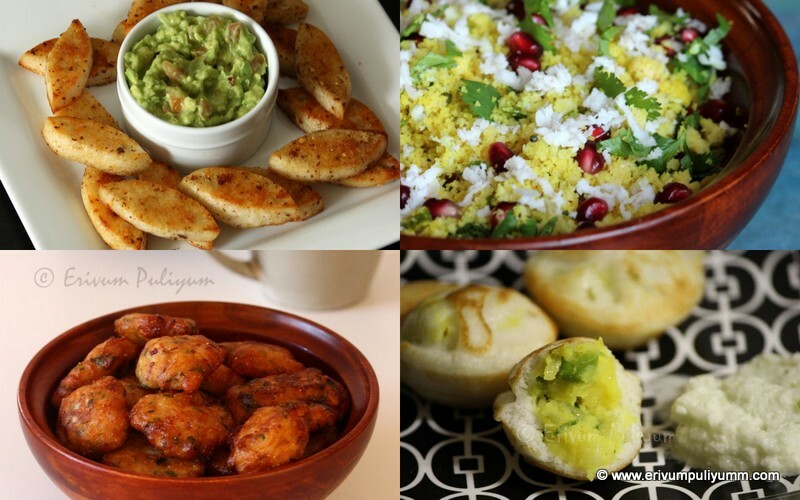 For more kerala snacks recipes,click this link. We are on lent till Easter and so all vegetarian recipes are on high demand.I love eating hot steamed rice with a simple stir fry and a pickle too.Kovakka (Ivy gourd) stir fry or thoran is an example of one such simple healthy dish that can be served with steamed rice.Ivy gourd has many prominent health benefits,it helps regulate the blood sugar levels and in turn prevent or treats diabetes.It is also purpoted to reduce inflammation and therfore is beneficial to patients with asthma,cholesterol and constipation.Ivy gourds are rich in Vitamin A and C.I frequently buy this vegetable from our Indian stores and make kovakka mezhukuparetti or this thoran recipe.Both are equally liked by my family.Give this a try and enjoy !! Heat oil in a pan and splutter mustard seeds.Add curry leaves,onion,sliced garlic and green chillies,saute until translucent.Add a pinch of salt to speed up the process. Add the spice powders-turmeric powder,chilly powder.Saute until raw smell disappears. Transfer the chopped kovakka,add salt.Toss it well and add half cup water.Cover and cook for 5-6 mins on medium flame. Uncover lid,give a quick stir.Add in grated coconut,adjust salt and mix well.Cover and cook on low medium flame for 5-7mins or till done on low flame.Dry up any water or moisture left and switch off flame,leave covered for 10 mins. 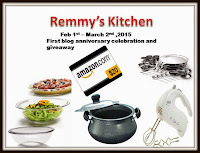 Serve warm with steamed rice !! * Apply oil in your palms,before cutting as this may leave stains at times,oiling helps prevent staining. OR Place the ivy gourds in water,each time dip your fingers in water when you pick up a fresh one,prevents staining. * You can chop the ivy gourd or kovakka as per your preference.If its finely chopped then there is no need to add any water to cook.In that case,cook on low flame. 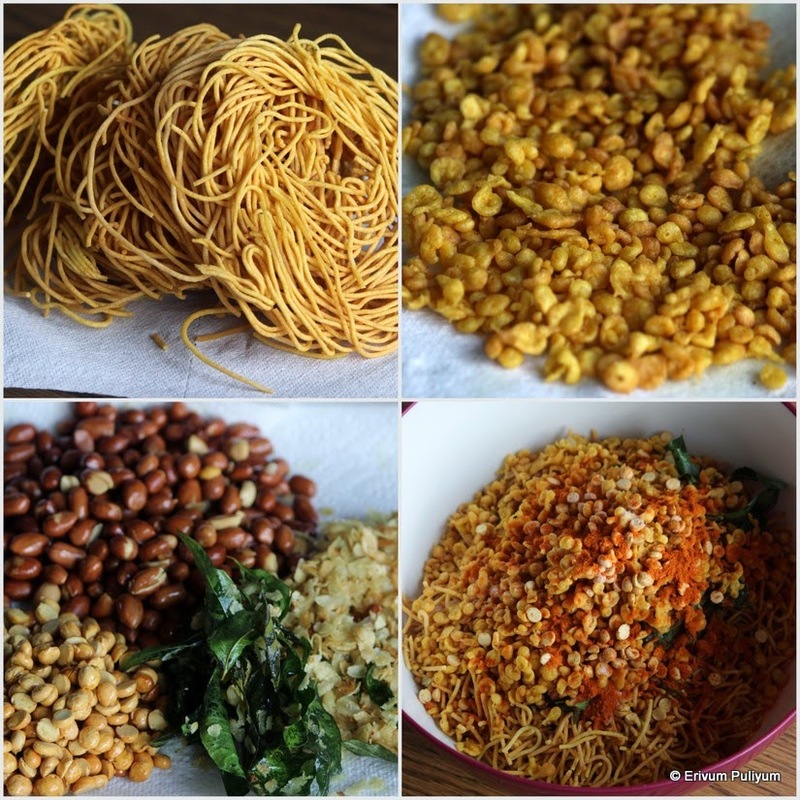 For more thoran(stir fry) recipes,click here. Eggless Vanilla cake or basic cake can be made in many ways but here condensed milk is the star.I personally like this cake for two reasons- one its a very quick cake that can be whipped up in minutes with out any fancy gadgets,second it is eggless.I have baked this cake few times and all of them were really good,and delicious.If you have a untimely guest,then this is a good choice with tea.I have incorporated wheat flour in this cake,to make it healthy but you can always use all purpose flour(maida) alone too.Adding wheat flour doesn't change much of the texture unlike other wheat flour cakes but its true that wheat flour does create a slight change in density.Do try & enjoy !! Sift the flours with baking powder,baking soda and pinch of salt twice so that the leavening are distributed evenly. Pre heat oven to 350 degrees F/180 degrees C and line a bread pan or 8" cake pan with parchment paper or line with butter and toss with flour. 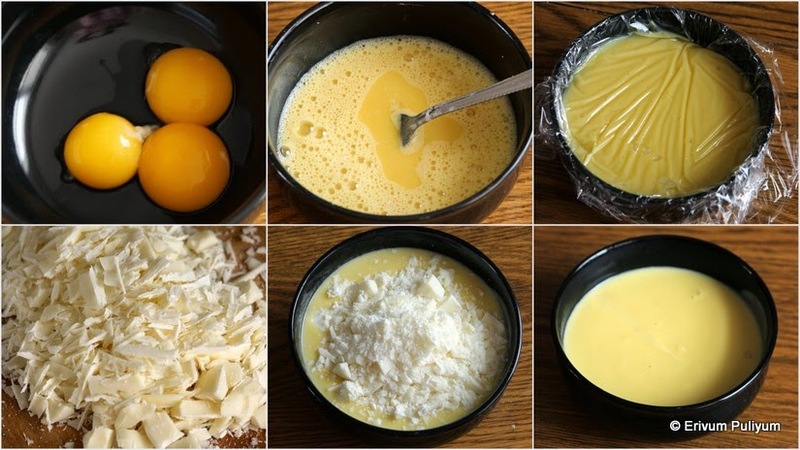 Mix the softened butter with condensed milk using a wire whisk until its light.Add the vanilla extract,combine well. Fold in the flours in two batches until incorporated using a wire whisk or spatula with adding water/milk as required.You should get a ribbon consistency. Pour in prepared pan and bake in oven for 25-30 minutes(mine took 30 minutes). Cool on wire rack completely and cut in slices.Serve with tea !! 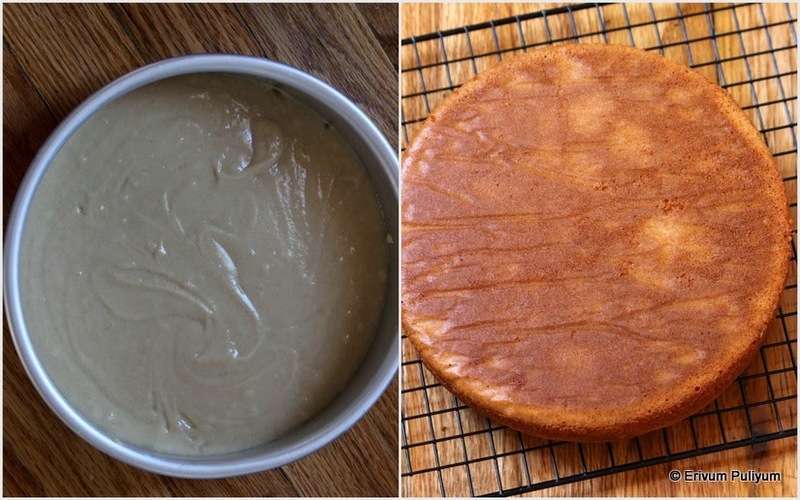 * I have tried baking this cake with both butter & oil.Use oil if you are very calorie conscious however butter adds a nice flavor,use unsalted butter 1/4 cup or 4tbsp at room temperature.However,this cake is made with oil. * I just lined my tray with butter and tossed with flour,worked good.I used a round 8"pan. * Use all purpose flour /maida for a airy texture.I make cakes frequently and don't wish to over load maida in our diet so just used the combination. * If you have a really sweet tooth then go upto a cup of condensed milk as there is no other granulated sugar in the recipe or taste the batter before pouring in pan and adjust accordingly. Preheat the oven at 350F/180C for 15 minutes. Lightly grease a 9×13 inch pan and line it with parchment paper. The texture of this eggless vanilla cake is neither too fluffy nor too dense making it a perfect base for shaped cakes and decorating. It slices off beautifully without crumbling. The sweetness of the cake is just right if you are going to frost it. Actually we preferred this sweetness even without the frosting. But if you are looking for something very sweet than you have to definitely increase the quantity of sugar anywhere between 1/4 cup to 1/3 cup. This cake was a huge hit in our family and with our friends. 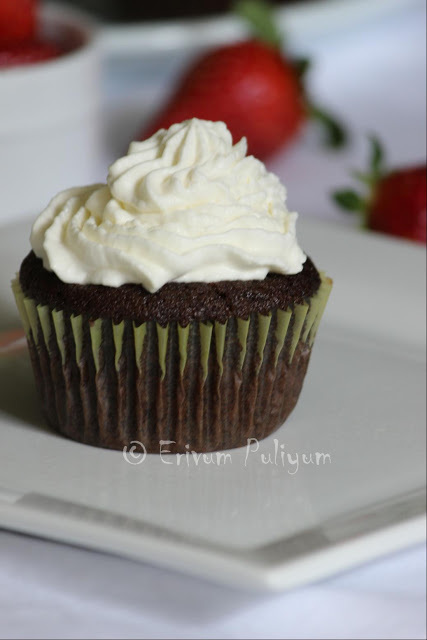 If you can’t find Ener-G egg replacer and try the best eggless vanilla cupcake recipe then this plain eggless cake with condensed milk is the way to go. In Canada we get a 300ml can of condensed milk unlike in the US where you can get a 14oz can (which is approximately 400ml). The original recipe uses a 14oz can and I think that’s the reason my cake was not very sweet. Fresh fruits and vegetable juices are full of powerful enzymes,antioxidants and nutrients that you can feel within minutes of having them.This is one of the quickest ways to deliver nutrients to important organs like liver.A healthy liver is a vital element of good health,yet most of us seldom pay any attention to this important organ.This ABC juice is a recognized liver tonic and rejuvenates that helps to ease the burden of the master cleaning organ and improve the way you feel.Hence,this juice increases the rate that you process the toxin in your body and helps cleanse the liver. The famous saying '' An apple a day,keeps the doctor away'' holds very true.Apart from the important health benefits of apple,they are general detoxifier and are rich in pectin.Pectin binds to the toxin intestines as they are digested and helps safely excrete them before your liver has to deal. Beets or beetroot are rich source of phytonutrients like betanin have anti inflammatory and anti oxidant properties,coupled with a stimulating effect on various detoxifying pathways in your body and especially the liver.Betanin promotes bile secretion and thereby improves digestion.It is also proved to regenerate liver cells and fatty deposits caused by years of alcohol consumption. Carrots are a rich source of pro vitamin A beta carotene and alpha carotene for protecting your body from radical damage.These nutrients are converted to vitamin A when needed and actually stored in the liver cells.Carrot juice is highly alkalizing to your body and helps flush the toxins in your liver and improves your eyes and skin.They are also a rich source of vitamin C,B and K and various important minerals. Spinach when combined with carrot juice effectively restores the bleeding gum disorder caused by vitamin C deficiency.The alkaline minerals in spinach are essential for cleaning out the tissue and maintaining the alkalinity of blood.They are also rich in iron and so regenerates,reactivates the blood cells.The anti inflammatory properties help improve conditions in people suffering from osteo and rheumatoid arthritis. Cucumber helps to regulate the blood pressure because of its minerals.They are excellent source of silica and helps in proper construction of connective tissue like bone,muscle,cartilage and ligaments.They also have alkalizing properties thereby reducing acidity.Cucumber juice is diuretic and so encourages the excretion of waste through urine.they bare excellent in reducing dark spots,puffy eyes,dark circles and other skin conditions. Lime is a rich source of vitamin C and also helps prevent oxidization of juice. Ginger stimulates overall digestion and helps protect your liver from oxidative damage. Drinking this juice and detox a couple of days/a week or a month improves the overall health and you might observe remarkable difference in your energy and mood levels.This improves the overall liver function and boosts immunity,tones up skin and general health.The juice should be taken empty stomach early morning and preferably one hour before breakfast for best results.We usually take it once a week but you can always take it daily as well.The juice tastes mildly sweet and doesn't require an additional sugar.But if you really are a sweet tooth,then prefer adding honey instead of sugar.Try & hope it improves your general health. I prefer to blanch the spinach in hot water and salt for 10 minutes.But you can always add it fresh. Wash and peel the carrots,beets,apples,cucumber. (peeling is individual preference,you can add just like that too). Chop them small.Add beets,ginger and carrots to juicer or blender and blend until crushed fine,then add in chopped apples,cucumber,spinach leaves and lime.Add a cup of water to blend it fine. Strain the juice and enjoy !! * Straining the juice discards the fiber so if you wish can drink it just like that without straining. * If you don't have cucumber or spinach then omit and make with the rest.Works fine. * There is no fixed quantity as such to make this juice.You can always increase the beets ,carrots or apples as per your preference.We do it this way and it tastes good. Have you ever wondered why kids keep running and jumping even after a tired school day ?? The answer is simple and straight that they have a toxin free liver and with growing age,the liver gets all toxic deposits.I hope this post is good enough for a good thought to enjoy this drink !! Idlis are considered to be the most healthiest food in South Indian breakfast as it is easy to digest and are guilt free steamed food.Quinoa(pronounced 'kinwa') is a seed and not a grain.Quinoa is a good source of protein and is gluten free and so is very easy to digest.They are also a good source of vitamin B,thiamine,riboflavin and folate.Quinoa is a bland tasting seed,I must say and it needs spices and other flavors to compliment its taste to the Indian flavor.Qunioa is available in red,white and black in color.I have used the white one.Thanks to many of our food bloggers who prompted me to try this seed in a desi twist and lately,I too started using this seed with tail in many recipes(coming soon).The first one in this row is quinoa idlis,I have tried this recipe thrice now and all have come out soft and spongy.I have used brown rice to add a little gluten but you can always use white rice to make these idlis.These idlis are slightly off white in color compared to the regular white ones.Try and enjoy super soft idlis !! Wash the quinoa under running water by holding it in a colander as the seeds are very small and gets easily drained away from hands.Soak it for 5-6 hours.Wash and soak the brown rice and urad dals separately. In a grinder or blender,grind the quinoa followed by brown rice and urad dal until smooth.Transfer to a bowl and aerate the batter using your hands.Add in salt and leave to ferment 6-7 hours. After 7 hours,grease an idli mould and place adequate water in a steamer.Pour batter in idli moulds,place in steamer and steam cook for 6-7 mins or until done. Remove from steamer,leave to cool slightly or invert the plates and hold under cold running water for minutes.Scoop out the idlis with a spoon and keep covered. Enjoy with any desired chutney of your choice !! * In a blender,add the ingredients in batches and grind.Make sure the motor doesn't get heated up frequently.Stop and run to get a nice fermented batter. * Adding salt can be done after fermentation,just make sure its well mixed. * Use white rice if you don't use brown rice. 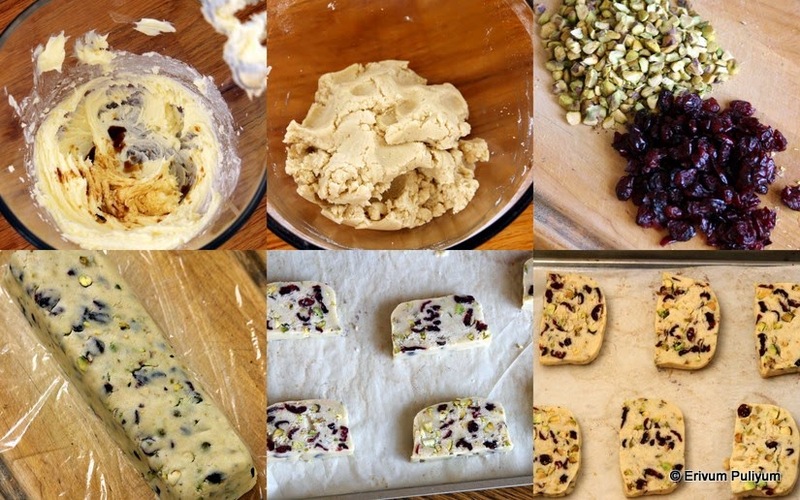 Eggless Cranberry Pistachio Shortbread(Step by Step Pics) & Saturday Snapshots #8 !! Cranberry Pistachio shortbreads represents mostly as a Christmas cookie.But to my family,short breads are always inviting all year through.A good tasting butter and pure vanilla extract are the only main concern to bake these shortbreads.There is no leavening agents,no eggs and a very small list of ingredients.You can always change to dried cherries or some other dry fruits and pistachio can be replaced with dry nuts.However,duo adds natural contrasting colors(green and red) especially if you bake around Christmas time.Cranberry adds a nice tart flavor and pistachio adds the crunch.This is a very simple bake that you can make without any fancy gadgets and tools.A word of caution- these are highly addictive and you may finish baking the first batch within no time.So,be prepared to make a fresh batch soon or make larger batches.Enjoy!!! 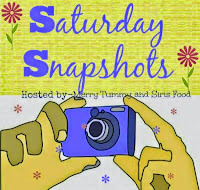 This time for Saturday Snapshots #8,Shweta@ Merry Tummy had given the theme- holding the food.I tried many with kids but didn't get a clear as they weren't stationery and they were busy in munching rather than posing.So,finally convinced h to pose for the shortbreads and got a decent shot,atleast better than not doing the task.Below is the pic and hope you like the shot !! Beat the butter in a bowl until creamy and soft.Add in the granulated white sugar and whisk again to make light and fluffy.Add in vanilla extract and mix well. Sift the flour with salt or using a wire whisk,incorporate the salt well in a bowl.Add the flour in batches and mix well to combine.Finally toss in the chopped pistachios and cranberries. Bring together the flour to make a soft dough.Spread a cling wrap and place the dough on it,form a log (square or round)shape of 8" * 3".Cover it with cling wrap and refrigerate the dough for 3 hours. After 3 hours,pre heat oven to 325 degrees F and line a tray with parchment paper. Remove the cling wrap and slice the log in 1/4" sizes(place your left hand on the parallel side of the log when you slice the other end,else it may crumble and you may not get neat slices.The hand gives the support to get thin neat slices).Place all on the lined tray. Bake in pre heated oven for 20-22 mins or until the sides turn slightly brown. Place on wire rack and cool for 15 mins.Enjoy !! * You can freeze the logs for 2 months and thaw before baking. * You can even chill the dough overnight in refrigerator and then bake. Rava Dates unniyappam is a healthy snack that you can make for kids.Unniyappam had always been our family favorite and I have already posted the traditional unniyappam recipe(using two methods).But this is more interesting as these unniyappams stays fresh a longer time than the traditional ones.Now a days,most of the bakeries in Kerala cater the dates unniyappams than the traditional ones.They replace the bananas with dates.During my last visit to Kerala,one of our neighbours told me this technique of using dates in the traditional unniyappams in place of bananas.However,trying out with rava is something that I came up with and that you can do easily than the traditional way of doing things.This can be made instantly too by adding a little baking soda.I haven't used any baking soda and left to ferment for 2-3 hours and then made these to get soft delicious appams.Try & enjoy !! Boil water (1/2cup )water in a pan and add the jaggery in it.Boil until the jaggery melts,turn off flame.Strain for impurities and keep aside to cool. 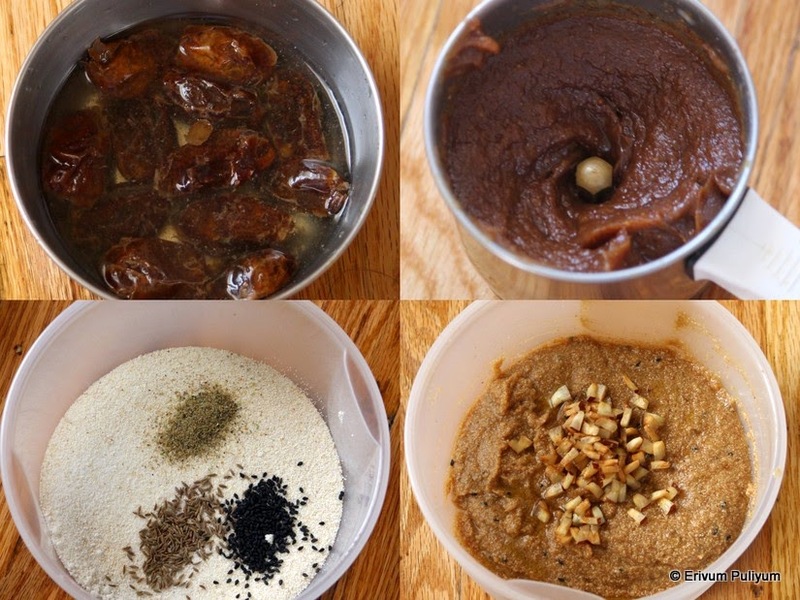 Soak the dates in 1/2 cup warm water to soften for half an hour.Grind this in a blender until smooth. Heat ghee in a pan and fry the coconut pieces till golden brown. Take the rava,maida,cardamom powder,sesame seeds,cumin seeds,pinch of salt in a wide bowl.Mix well with a whisk,add in ground dates paste.Add the melted jaggery and make a smooth batter like for dosas.Add in the fried coconut pieces along with the ghee,mix well to combine. Cover and leave to ferment 2-3 hours(leave it in oven with lights on if you livein colder places).After fermentation,heat the paniyaram pan.Pour oil in the holes until 1/2 full and let oil get hot on medium heat. Check the consistency of batter and if required add 2-3 tbsp of milk/water to get the dosa consistency(rava may absorb water and the batter may turn thick as in pic).Mix well. Let the other side get cooked & brown too.Remove from flame using the skewer and drain on a paper towel. Pour oil into the holes if required for the next batch.Let it heat and then pour the batter.Repeat the same steps till you finish the batter.Serve with tea !! * I have made these unniyappams by only adding dates paste alone too.In that case add upto 20 dates.Its mildly sweet unniyappam. 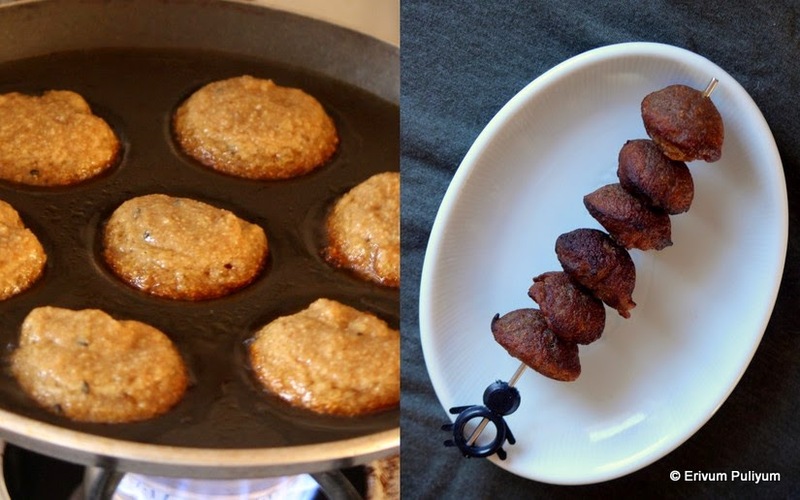 * Dates increases the shelf life of unniyappam and stays good for 4-5 days unlike the traditional ones made with banana.You can even add the same dates to the traditional unniyappam and replace bananas for better shelf life. * If you wish to make unniyappams instantly,then add 1/3 tsp of baking soda to the batter.No fermentation required in that case. * You can replace maida with rice flour too if you wish.Maida adds to bind the rava together and adds crispiness. * In place of jaggery,you can add sugar if you like that way but yields a light brown color. Lunch box for kids is always a big question with every mom and each of us wish our kids to enjoy the meal.And at the same time,each meal should be balanced with adequate protein,carbohydrate,vitamins and minerals.My headache starts the previous evening itself to decide what to pack the next morning.Lunch box for adult or kids always seeks some interesting yet delicious and filling meal.My elder son loves to eat steamed broccoli and that's how I ended up trying this recipe.Initially when I tried it with only broccoli,my family didn't accept that much as it gave a fried rice like texture and so the demand was to have a gravy/masala along with that version.But when I tried this style,all were happy to have a mildly spiced broccoli pulao and they enjoyed it very much without any sides.I was very happy too with the outcome.Give this a try if you like broccoli florets and enjoy !! Blanch the florets in hot water,add salt.Let it stand for 15 minutes-20 minutes.Drain the water,wash under running water and leave aside. Wash and soak the rice for 20 minutes.Use the same water used(to soak) for cooking rice.Add this water(2 cups) in a cooker and bring to a boil with salt.Add the rice and stir well.Let it cook on medium flame till half done,add the broccoli florets to this and cook until all water is absorbed and rice is cooked(takes 10 minutes). In the mean time,heat another pan.Add oil and add cumin seeds.Then add dry red chillies and then chana dal.Add in broken cashews,asafoetida.Slide in the chopped ginger and garlic,saute until raw smell disappears. Add the sliced onions and then fry till translucent.Add in the spice powders-chilly powder,turmeric powder,garam masala.Saute until a nice aroma releases on low flame.Add the chopped tomatoes and cook until mushy.Add salt. Add the cooked rice with broccoli as a top layer.Cover and simmer for 5 mins. Mix well and serve warm with raitha or pappadam !! * If you have idli milagu podi,sprinkle on top.Tastes good or enjoy just like that. For all lunch box/one pot meal rice recipes,click this link. White Chocolate - Apple Pie & 600th Post(Valentine's Special) !! I can't believe my eyes on seeing this number as I never thought to cook so much in life if it was away from food blogging.Though the posts have crossed 600 long back with events and other posts ,but the total recipes comes to 600 today.Hardly knew to make tea and chapathis before marriage and this is really a big number to me.The biggest support is my family who always love to taste different cuisines and tastes.They enjoy all good recipes featured here.And once in a while,become guinea pigs for the flop ones too.Good critics on every dish to improve is from my h and kids.Then,the second biggest inspiration comes from my fellow bloggers,readers and friends who always encouraged me to try out different recipes which gave me sheer confidence to excel that dish.My consistent friends cheered me up with the lovely comments.Thank u dearies,loved reading all of them.Finally,thanking God for instilling me the confidence to cook,share the dishes and his abundant blessings too. Valentine's day is just around the corner and each one might be busy making their yummy dishes to conquer the hearts of your loved ones.Today's recipe is a perfect dessert that you can make for you valentines day parties.The natural way of making roses with apples,enjoyed making them.Chocolates are inevitable on Valentine's day and here its white chocolate.The dessert is very rich and the filling is silky smooth that all can enjoy !! FOR PIE CRUST-I have used this recipe here to make the pie crust.Refrigerate for an hour.Remove from refrigerator and on a lightly floured surface,roll the dough in a large circle of 10" round.Place it in the pie pan(I have used foil pie pan).Place the rolled dough in the circle and gently shape the sides as in this pic.Prick with a fork in the center of the pie so that it doesn't puff much.Pre heat oven to 400 degrees F and place,bake for 25-30 mins.However,you can always use ready made pie crust too. FOR CHOCOLATE FILLING- Beat the egg yolks in a bowl.Add in the vanilla extract,corn flour,all purpose flour(maida)and 1/2 cup milk (at room temperature),mix well.Bring milk 1 1/4 cup milk with 1/4 cup whipping cream to a boil.Add the beaten egg mixture slowly and keep stirring.The mixture thickens and forms custard.Switch off flame and leave till its warm.Cover with a cling over the surface of the custard and leave aside.When its warm,add the grated coconut and mix well.Stir until chocolate is melted and combines well.Cover and leave again until use. FOR MAKING ROSES-Knead the flour,sugar,salt and ice water in a bowl and refrigerate the dough as a thin disc wrapped in cling wrap.Remove from refrigerator after 30 mins and roll on a lightly floured surface in thin strips.Cut thin lengths and leave aside.In the mean time,slice the apples and add top the boiling water in a pan.Add in lemon juice(to prevent discoloration),mix well.Let the apples stay in water for 2-3 mins and remove from water.Place it by spreading in a plate.Pre hjeat oven to 400 degrees F.Place 6-7 slices in the middle of one rolled thin strip;overlapping the next(as in pic)and then finally covering the apples with the exposed strip.Then roll it tightly to give the rose petals look.Simnilarly repeat to make 4 more roses.Place it in a muffin tray or just a pan.Bake in pre heated oven to 20-25 minutes.Remove and sprinkle confectioners sugar on top.Leave to cool completely. ASSEMBLING- Pour the cooled chocolate filling in the ready pie crust.Set in freezer for 2 hours.Remove and place the roses on top.Refrigerate again overnight by covering with a cling wrap.Slice and serve immediately as chocolate melts down. * I made my own pie crust from scratch,the same recipe which I used to make the cherry pies.I just used the same measure to make one large pie instead of individual small pie.The recipe with step wise pics is here,so not sharing them again. *You can use apple juice instead of water for boiling apples.You can glaze the apples with honey and cinnamon too instead of confectioners sugar. * You can make the thin strips longer than I made so that you can make more petals on the rose and the width can be reduced slightly because after rolling the dough becomes fat and plump. * You can replace dark chocolate for white chocolate. * The pie has a moderately sweet filling with white chocolate but with dark chocolate the filling will be apt.If using white chocolate like in this recipe,you can reduce the sugar slightly. Happy Valentines Day to all ! !